Sedlescombe Golf Club, set in the beautiful landscape of East Sussex in '1066 country' was opened in 1990. The club offers on-site accommodation (mainly used for people attending the James Andrews School of Golf), good quality practice facilities and an 18 hole, Par 72 parkland course. The course stretches to nearly 6,300 yards off the back tees and offers that wonderful mix whereby it is challenging without being too difficult for the higher handicap player to enjoy. The mix of holes is good and some of the views across the surrounding countryside are excellent. Another love of mine !!!! Another faithfull of mine, I like you so much I always return. My 4th annual visit (details of my 3 days golfing trip with the girls will be on the Forum for your perusal). On the 1st Tee, I am always greeted by "Ben", not my Caddie, but the friendly little dog (terrier)from the farm next door. the mascot I suppose. One needs to be accurate as there are some tight fairways, lots of ditches strategically placed and not seeable from the Tees, sloping up or down fairways with guiding post in the middle and bells to ring once you on safety grounds. Greens are of varied interest, tiered , rolling one way and another way, difficult to decide where it turns. Over the 3 days of play, it was 3 different situations because of the weather conditions. Every hole has a beautiful setting, splendid backdrop, very colourful at the moment. Lots of water comes into play, I believe 9 lakes altogether, streams and ditches and public paths with horse ridders crossing.... Not a flat course either, up and down, keeping ones legs well toned. 4th:long Par 5 over 500yards, 2 lots of ditches, green not seeable from a distance so use the guiding post but then if you are not accurate the sand bunkers are sure to catch you. 5th: Par 4, 494 yards, Tee raised, sloping down to a raised green with slopes. 9th: Par 4, 380 yards, is a beauty of hole, dog leg, sloping left,guiding post for Tee shot, 2 adjacent ponds before the green slightly sloping towards the main pond: a real delight. 11th: quite a difficult hole, slight dog leg, needs careful management. 12th: I love that one,the adrenaline flows, the 1st tee shot is at the electric pylone, then sharp dog leg, sloping down, green set in a very tight corner, sloping on one side, no bunkers or water as it is fearce enough to test you. 16th: a real challenge, dog leg to left, oob on right, water on left, a sloping green with bunkers to catch the errand ball. 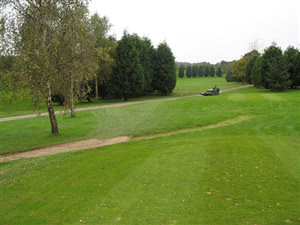 18th: Par 5 444 yards, another truly nice hole, raised Tee (dont forget to wear a helmet....), guiding post as it is a dog leg sloping left, oob on both sides, descent to the green, pond on left and a stream or ditch with water at the back of the green. I hope you are tempted to try this golf course it is well worht it. The whole set up is well appointed : Sedlescombe is the home of James Andrews International Golf School that I have attended on several occasions. There are 7 putting greens, all of different interest, a huge driving range, a Video studio where Students are filmed and learn what to do or not to do.... An excellent chipping, pitching and sand practice area at the back of the driving range. There is also a short Par 3 course which is very testing and quick to do. Well appointed Pro shop, no Ladies stuff yet as the members have not decided on their colour schemes and styles yet. The Ladies Loo is very unusual, well it is a big room with not 1 but 2 loos adjacent to one another, more like "hers" and "his", but I suppose he will never get to use it ? Extremely friendly and efficient staff,lots of local students working behind the bar, a nice buzzing atmosphere., young, bubbly. You also get the international students, young and not so young, the members and the locals coming to eat or enjoy a drink. The General Manager was away in Malta visiting his Millionnairess girl friend, the President who normally shares Champagne with visitors was not seen this time, problably in his villa in Spain. To recap from the "short" review above: Sedlescombe is a beautiful parkland course in an ideal setting, 10 minutes from the historical Battle, East Sussex. Very good course for all levels of players..great facilities,friendly staff and pro's are always around to help.course is playing long in the dry weather.recommend playing..